I was at a customers house last week. I've cleaned his carpet and upholstery several times over the years and I have always been amazed at at how good his 15 year old white carpet is. It always looks clean and has no stains or blemishes, just a field of fluffy white carpet. The thing that really surprises me the most is the fact that he has an older dog, and most people who have a dog in their home have some sort of pet related odors they can't seem to get rid of. Pets leave all sorts of things in the carpet, look at the side diagram to see a few. No matter how many humans live in your home I would bet dollars to doughnuts that the dog is leaving more soil in the carpet than all the humans combined. My customers primarily live in Tampa FL and we have a pretty severe sand problem down here. It's everywhere. Pet's, especially dogs, track in a ton of sand in the pads of their paws. So how does my long term customer keep hes carpet so white with no pet odors? good question. I' asked how he deals with spills and pet issues. He said he simply pours water on spots and stains and vacuums it up with a wet/dry vacuum. Yep that's it. No special DIY carpet cleaning solution, no magic, just water. I can't stress this enough. When removing pet odor from carpet using copious amounts of water is all that is needed. Pour water on the pet spot and wait 30 seconds. Then using a wet/dry vacuum, that you can purchase at any hardware store, vacuum it up. You can remove about 95% of the odor with just water. It's really that easy. If you still have a problem after that call a professional carpet cleaner for help. 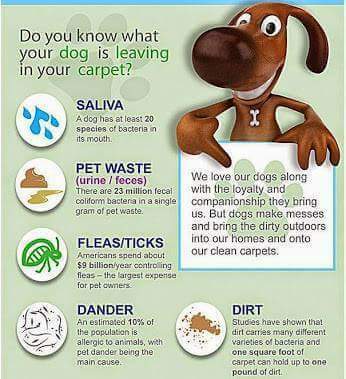 To remove pet odor from carpet in Tampa FL call Chem-Dry of Tampa.